Pensacola, Fla. (WKRG) - Inside a place called the "Wall of Death." That may be the last place you'd expect to see the Easter Bunny. But that's exactly where I found the big furry guy this weekend. He wasn't hiding Easter eggs. The Easter Bunny was hanging out with a bunch of bikers at Harley Davidson of Pensacola, and specifically with a couple of daredevils called the Ives Brothers. The brothers brought their crazy stunt show to the dealerships "Kick A%%" spring event, wowing crowds with death defying stunts. The "Wall of Death" is an old school wooden track. The brothers, Kyle and Cody, ride vintage motorcycles inside the track, spinning around the wooden wall until they reach 4gs. The Easter Bunny was their to greet kids. But he also got to watch the whole show from the inside. So did I. The gravity helps them stick to the nearly vertical wall. 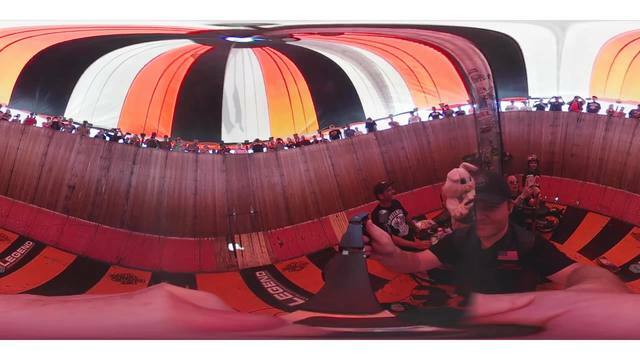 Crowds gather around rim of the big wooden barrel and watch the daredevils as they avoid crashing into each other as they ride up very close to the crowds. The inside vantage point led to some really cool video. Make sure and watch the clips in this story. The brothers got their start watching their dad ride inside a steel wheel in the circus and started doing the same when they were just little kids. Their training started on bicycles, until they eventually graduated to motorcycles. If you are interesting in learning more about the Ives Brothers, the "Wall of Death", or where they will be next, check out their Facebook page. Chris Best is the News Director for WKRG. He's a husband and father of four. He's also a motorcycle enthusiast.